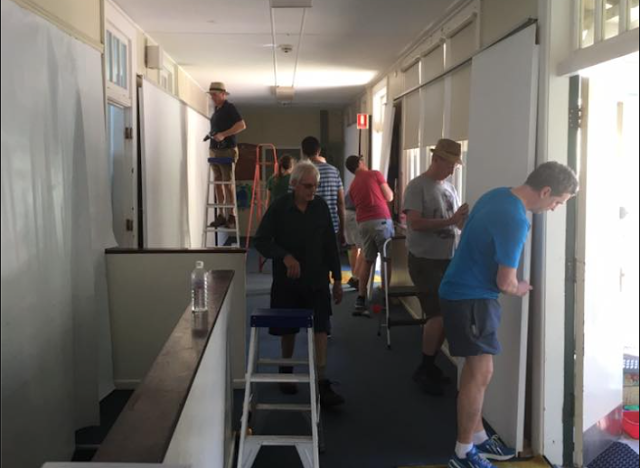 Work is currently underway to turn the tiny Scarborough Public School into a gallery and festival for this weekend’s Annual Scarborough Art Show. Now in it’s 18th year, the Art Show is a must-do on the Northern Illawarra social calendar, and a great place to collect the works of our talented local artists and artisans. It’s a huge job for the parents, but as the major fundraiser for the school, they pull together to make it happen, and make it fabulous. One parent who’s been there every step of the way is Wombarra artist Paulineke Polcamp. Part of the original team who instigated the event, Paulineke (Pol) says she’s loved being part of Art Show history, both as an organiser and as an exhibitor. “Basically, 18 years ago we didn’t want to sell chocolates,” she laughs. “The principal at the time was Dave Martin. He was fully behind the idea of an art show, and the rest is history. “My daughter is 30 now, but I still come and help with the art show every year. It’s fun to get in and help a few days a year. Plus I get to catch up with people. The Scarborough Art Show is being held this weekend. Opening night is Friday October 7 with the art show held on the weekend of October 8 and 9 at Scarborough Public School, Lawrence Hargrave Drive, Scarborough.